Are you a glass half full, or half empty sort of angler? The end of daylight saving has come around (Sunday, April 3) and there's not a lot of time left for fishing after work. But the long Easter break is on the way and we have reports from various parts of the country of trout in prime condition as they prepare for winter spawning. In Hawke's Bay and other North Island regions, trout are still chasing cicadas and other bugs on the wing. Taranaki rivers are "very fishable” and thanks to some solid rain, there have already been some early spawning runs on tributaries that flow into Lake Rotorua. Wellington has had some "awesome” fishing. 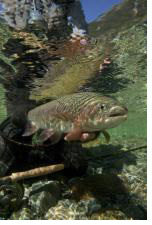 Down south, sockeye salmon have been grabbing media headlines – spawning by the thousand in the Waitaki catchment (see Fishing News below for more details). 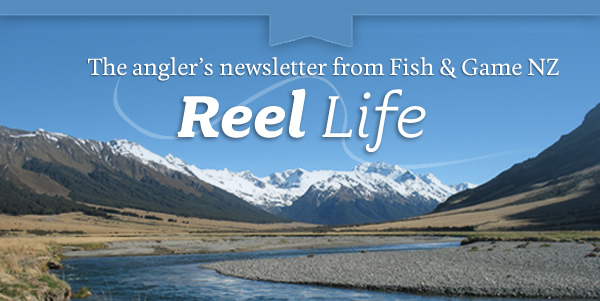 For salmon anglers, the Rakaia and Waimakariri are getting reasonable catches at the moment. The Waimakariri usually fishes well right until the end of April. The next few weeks are the perfect time to target stream mouths on the big central Otago lakes. On the West Coast, salmon fishing has been slow in some of the more regular spots such as Lake Mapourika, but other less fished waters have been producing well. Increasing numbers of salmon have been caught in the braided Westland rivers over the past few weeks. P.S. - This month's cover pic shows ????????. The OECD's report on New Zealand's environmental performance is crystal clear, says Professor Dame Anne Salmond. New Zealand's 100% Pure reputation is at immediate risk from the degradation of many New Zealand lakes and rivers. International media, buyers of New Zealand products, tourism interests and public opinion polls have all been ringing alarm bells, and now the OECD itself has joined the uproar. For details click here. The Southern Hemisphere's only population of the mysterious sockeye salmon has started its spawning run in the MacKenzie Country's alpine rivers, providing the region with a new tourist attraction. In the Twizel River, the sockeye are passing under the State Highway 8 Bridge near Twizel township, and the sight of hundreds of fish moving up the river, and spawning right below the bridge, has become popular with tourists and locals. Details here. Nelson-Marlborough Fish and Game staff have released 150 brown trout flying bright green streamers into the Riuwaka River (formerly Riwaka), near Motueka. The trout were from 1000 that had been electrically fished and taken to Pieter Wilhelmus' Wairau Valley hatchery, where they were raised in ideal conditions to improve their chances of survival. The trout were tagged and trucked 160 kilometres back to the Riuwaka, before being released into three sites along the river. Fish & Game asks that anglers who catch the tagged trout release them if possible in the first year, but still let them know the tag number, date, time and location that the fish was caught. Read here. Grab a bargain… If you haven't got around to buying a licence, a winter trout fishing licence is a great buy! The winter season started on April 1 and runs until the end of September. In other words, you get to fish the second half of the fishing season. For $75 you can chase trout at a time of year when they're in great condition. Click here. If you hunt as well as fish, a reminder that game bird hunting licences are on sale – with some of the money raised going towards preserving New Zealand's shrinking wetlands. Click here for details. I like to doze in the afternoons. Not that I'm lazy – I just find it pleasant. Early morning is activity time, when the air is clean and fresh and cicadas are waking and trout move in sun-dappled pools. The first hatches of mayflies rise in the still air and gnats spin in circles. Swallows dip to the water, scattering silver drops as they take hatching caddis, and as the sun warms the boulders at the bottom of the run, trout rise. At the head of the run, on boulders beside the pool, shags spread their wings in the sun. They lack beauty of form and function, dripping wet and dishevelled, squawking in discordant tones that match their appearance – more like their dinosaur ancestors than creatures of song and glorious flight.